Today marks the start of Deafblind Awareness Week. The duration of the awareness week is the 26th June – 2nd July 2017 and the aim of the week is to let people know that combined sight and hearing loss is more common than they think. During this time, Deafblind Scotland, Deafblind UK, About Me Care and Support, Community Care Opticians and other organisations will host a series of events and activities to raise awareness of dual sensory loss. Do you know someone who has the TV turned up far to high, who often asks you to repeat yourself or who doesn’t recognise you if you pass in the street? Combined sight and hearing loss, particularly milder forms, is more common than we think. With an estimated 394,000 people now considered to be affected by dual sensory loss, it is likely that we know someone affected by this. 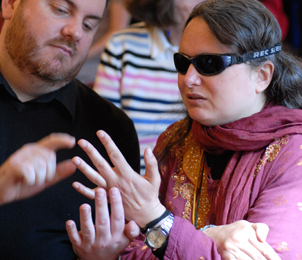 During Deafblind Awareness Week we encourage you to think about friends and relatives who might be affected by sight and hearing loss and talk to them about it; try to understand what they are going through and learn what you can do to help. Sign Language Interactions are proud to support and promote Deafblind awareness week and encourage others to help spread the message and raise awareness.